You are reading page 2 of New Student... Feeling Unsure. If you want to start from the beginning Go to First Page. BaltimoreHon works as a Neurosciences, RN. Sometimes in life we do what we have to do so we can do what we want to do. themommy, many people assume that students in BSN programs are there because their goal upon graduation is to provide direct patient care, so they are surprised that someone doing their clinical rotations is shocked by the realities. However, the sad truth is that information regarding the realities of clinicals is NOT provided to students at the time it should be: PRIOR to their making a decision to be a nurse. I think that you ARE a good candidate for nursing. 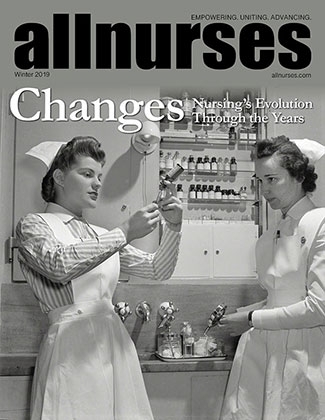 You had a first-hand up-close look at relatives/friends who had non-traditional nursing jobs, and you wanted to follow in their footsteps and make a similar contribution. The profession of nursing offers a wide variety of extremely challenging career choices that require high levels of intelligence and skill, but involve minimal to no patient contact. These include administration, research, informatics, epidemiology, and public health policy. And, yes, you can enter these fields upon graduation, without ever working in a traditional patient care position (be aware that the wage levels could be significantly lower). The patient care experience you are getting in your clinicals should be adequate for most positions, but you want to be sure that you focus on doing well in them as much as you do on academic excellence. People hiring you into those positions will definitely look at that. The other thing I recommend is that you begin to network. Find nursing professors at your school that may be involved in research or informatics, and offer your services on a volunteer basis. If your program isn't that large, ask your instructors to hook you up with faculty at larger universities. Ask your friends and relatives in nursing/health care to help you connect with people/programs that are aligned with your career interests. Use your school breaks to work for them (even unpaid) - it will look impressive on your CV when you go out for a "real" job". Take what BaltimoreHon said seriously, get yourself through this relatively short period of clinicals, and I think that you'll have a great career path ahead of you. Keep in mind, however, that additional education along the way is almost a certainty if you want to advance in both salary and professional challenge levels (masters and PhD). From what you have written about yourself, I don't think that will be an issue. Best of luck, and hang in there!! Some are. It depends on the type of research, size of study, etc. Researchers on large studies are always looking for good people to work as research assistants. In themommy's case, she could work with patients conducting lengthy interviews, taking medical histories and vitals, and conducting noninvasive testing. She could also be involved in reviewing medical records, harvesting data, creating protocols, and writing research papers. For many researchers, getting someone with themommy's background would be a real bonus. You'll note that I mentioned that she should expect to make significantly less than she would taking patient care shifts in a hospital. And her official job description would make it appear that she was overqualified for the position. However, this is how to break into research on an entry level. And a good program manager or principal investigator will let a research assistant work to their skill level, not only to their job description. In academic institution research settings, studies are chronically short of help; if you're lucky enough to get an employee that is a bright self-starter with initiative, it's even more of a bonus. And word about good research assistants spreads quickly in these settings. Between that and the incredible networking and educational opportunities, a bright new grad could be directing studies or programs within a couple years. Keep in mind that these are very large university or private nonprofit research institutions. if you're not in an area that is anywhere close to one of them, or you're not in a position to relocate, that's a problem. But any student who IS in school at one of these places, and is interested in a research career, should start networking when they start nursing school, and should use their school breaks to volunteer as staff on a study or project. If they are really good, there could well be a decent-paying, challenging position waiting for them when they graduate. BTW, I spent many years recruiting research staff in the settings I describe. I think you should give it a chance to settle in. Maybe you should consider Public Health nursing or Public Health Promotion/Health Education in general. However, to become a PH Nurse you will probably need a year or more experience in bedside/hospital-setting nursing to get some skills and take an exam. Also, the pay, hours, and required experience varies depending on your area. It may be a little rough in the hospital now, but later you will have a great deal of options and a better idea of which direction you want to take. Check out the Specialty tab and go explore. Also, take a look at the Public/Community Health tab. Try to go shadow someone in that area if interested. Well dude I hate to tell you this, but I think that if you don't like people and everything that comes with them, you never will. However this is a possibility that they will grow on you and you will become successful. All the best to you and hope that everything will go well. Just stick with it... it's a great career choice. Great benefits, great salary, great prestige as well. Definitely something noble to do.